Andreas Berger (Mimi Secue, Le Charmant Rouge) is back with a second solo album, delivering some more of his interesting laptop sounds. 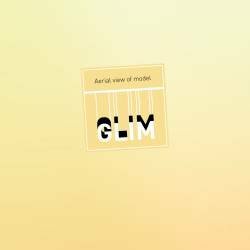 Unlike his fellow Austrian B.Fleischmann's more accessible indietronica, Glim aims at a more experimental angle, presenting song structures stripped of their content, making the analogy to scaffolding more than fitting. For a casual listener, not much will be happening on Aerial View Of Model, but the album shouldn't be dismissed to easily. I wouldn't say that form is more important than content on this album, yet somehow I get the impression that these two words form an intricate synergy that makes it hard to discern where the structure ends and the song starts (or vice versa). Starting with three miniatures that work the listener into the right mindset, the album's highlight comes with the long Takeoff, a hypnotic drone song with a very deep yet subtle bass underneath. Three more short tracks follow, of which Glaze convinces as a proto desert rock song with comforting tape hiss in the background. The album ends with two longer pieces. Seaside is very ambient and therefore a bit unusual for Glim, but the concluding Next Day consoles with its typical Glim sound, meaning the combination of acoustic guitars, laptop keyboard, static noise and tape manipulation. Aerial View Of Model is neither ambient nor indietronica, but dwells in a narrow valley in between, using a more experimental approach and demanding more attention of the listener than from dreamlike soundscapes or danceable electro-pop. Therefore this is certainly not an album for everyone, but if you like to decipher a song out of a structure, there is certainly a lot to discover in these nine minimalist suites.